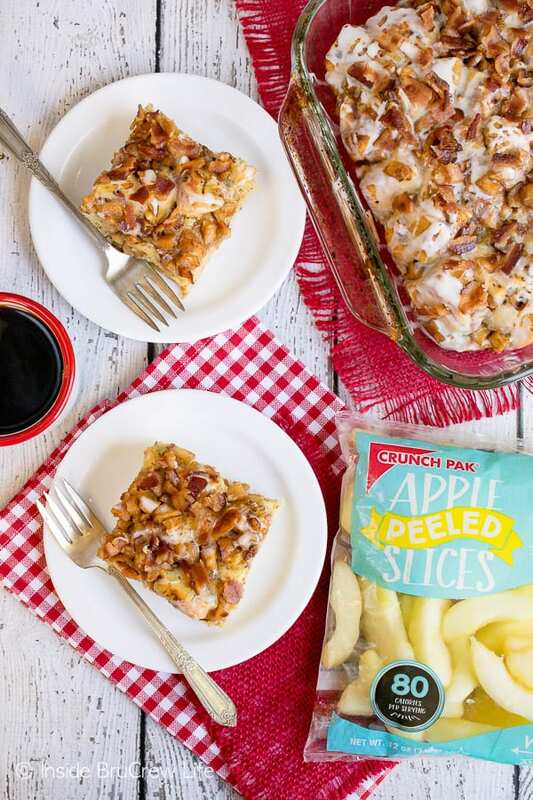 Add a pan of this Maple Bacon Apple Cinnamon Roll Bake to your breakfast plans. 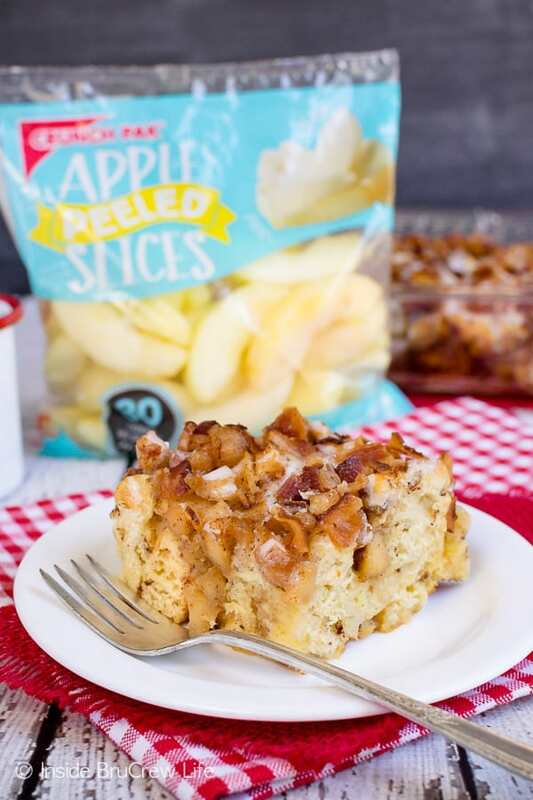 Soft apples, crunchy bacon, and maple drizzles all in one pan is a very good idea. One of my favorite things to do when we travel is to find different donut shops to try out. Crazy toppings are definitely what I look for in a donut. Recently, we were in Miami on National Donut Day, so we found a fun donut place. It must have been a popular shop because the line was out the door. We stood in line looking at their list of flavors and trying to narrow it down. It was so hard to just choose a few. Honestly, I would have loved one of each, but that wasn’t the smartest choice for my jeans. So we got a berry buckle, Nutella, and coffee tahini since only two of the five of us really wanted donuts that morning. 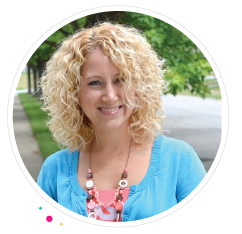 Yes, I looked at those three boys like they were aliens. At least my girl is with me on eating the donuts. Maybe if I had ordered the maple bacon donut I could have convinced my husband to eat donuts with me. That is usually his go to donut anywhere we go. There is a local donut shop in our town that has a pretty amazing one, so I can see why he always gets that flavor combo. This month as I was deciding on what recipe to make with the bagged apples in my fridge, I kept coming back to the maple bacon combo. I just knew it would be absolutely delicious paired with apples. As a brand ambassador for Crunch Pak apples, I am always looking for new ways to include apples in our recipes. We almost always have a few bags of apples in our fridge for easy snacking or baking. 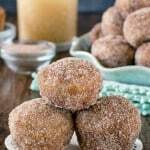 This Snickerdoodle Apple Cake and these little Cinnamon Sugar Apple Donut Holes are two apple recipes that my family absolutely loves. At first, I was going to make a fun new baked donut or little hand pie this month, but then I saw a few rolls of refrigerated cinnamon rolls in the back of our fridge. I’m not sure when or why I had gotten them, but immediately I knew they were the perfect base for this easy french toast bake. Last summer I made this Strawberry Chocolate Cinnamon Roll Bake, and my family devoured it in no time at all. 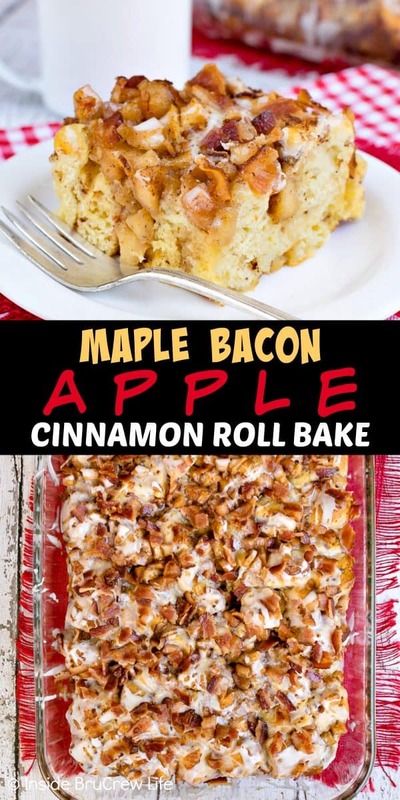 So, I knew adding cooked apples, crunchy bacon, and a maple glaze would go over well with them. Or at least with my husband. He isn’t a huge sweets eater, but when I make things like this he goes to town on it. He kept coming back for small little pieces, so I’m calling this recipe a major win. You can cook your bacon in the oven. 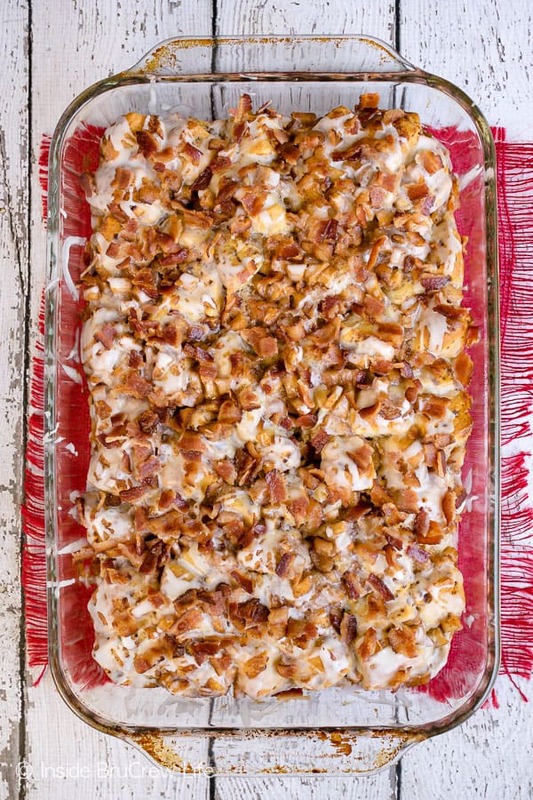 Line a large baking sheet with foil and line the pan with the strips of bacon. Pop it in the oven and cook it at 400 degrees for about 20-25 minutes, depending on how crispy you like your bacon. Place the bacon on a paper towel lined plate and set it aside to cool. Dice the bag of Crunch Pak Apples and cook them in a skillet with some maple syrup until they are soft and tender. Whisk together the milk, eggs, and maple syrup in a bowl. Cut up the rolls of cinnamon rolls and place them in a greased dish with the cooked apples. Pour the egg mixture over the cinnamon rolls. Bake for 25-30 minutes and then cool for about 10 minutes. Stir some maple syrup into the little frosting cups that came with the cinnamon rolls. 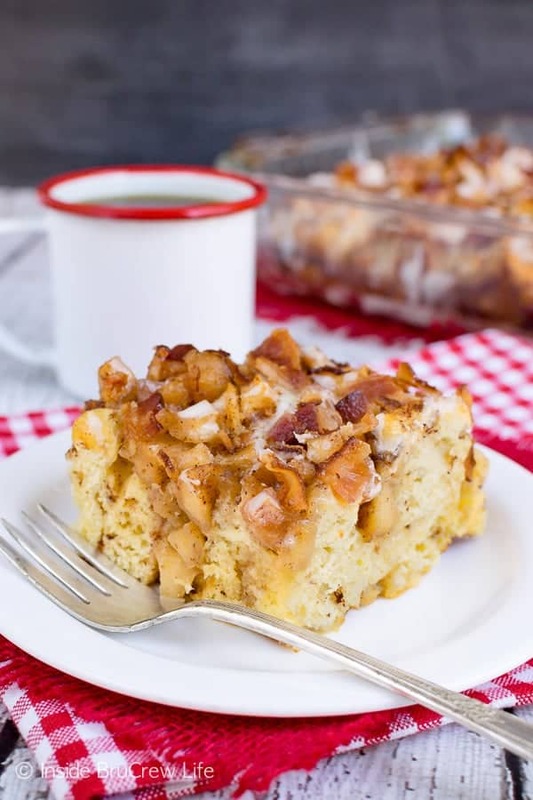 Drizzle this glaze on top of the breakfast bake and sprinkle with crunchy bacon bits. 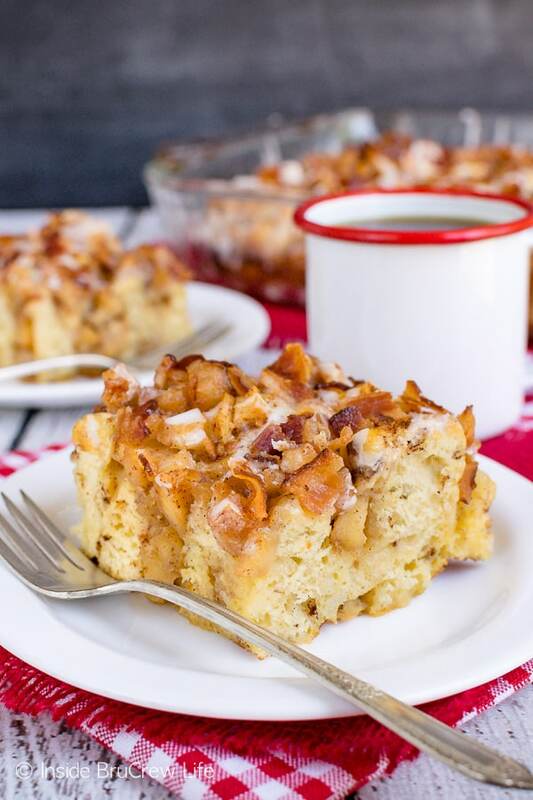 This sweet Maple Bacon Apple Cinnamon Roll Bake is a great treat for breakfast or brunch. It’s easy, and it tastes amazing! 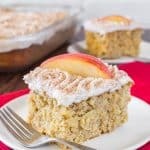 Maple Walnut Apple Cake – this easy cake is loaded with nuts and fruit and is topped with a creamy cinnamon cream cheese frosting. It’s amazing! 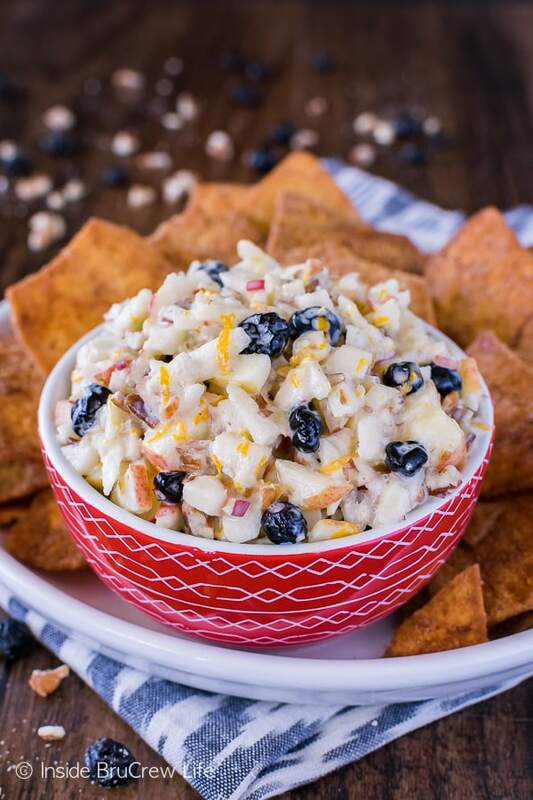 Skinny Apple Blueberry Salsa – diced apples and dried blueberries in a light orange yogurt sauce makes a great dip to enjoy during the hot summer months. 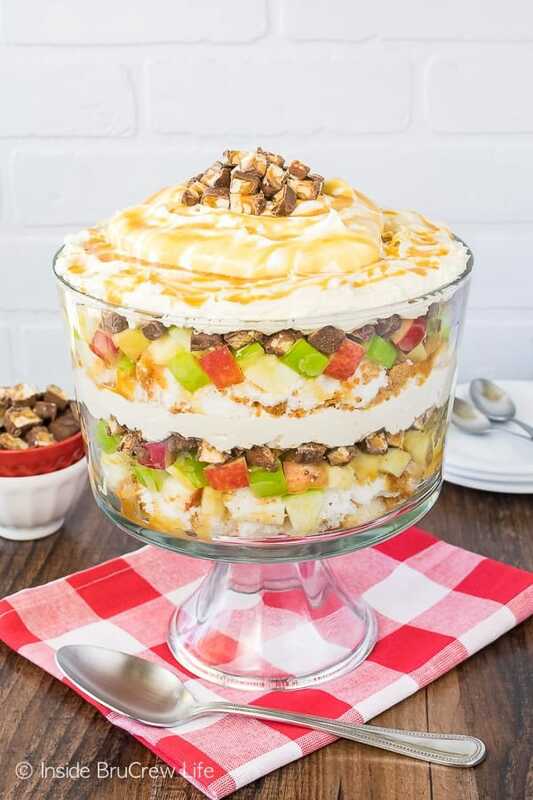 Apple Snickers Cheesecake Trifle – layers of apples, cake, cheesecake, and candy bars makes an impressive no bake dessert. 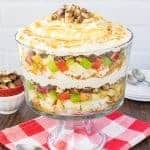 Perfect for summer parties or picnics. 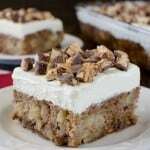 Caramel Apple Cheesecake Bars from Shugary Sweets – cookie crust, creamy cheesecake, & apples with streusel sounds amazing! 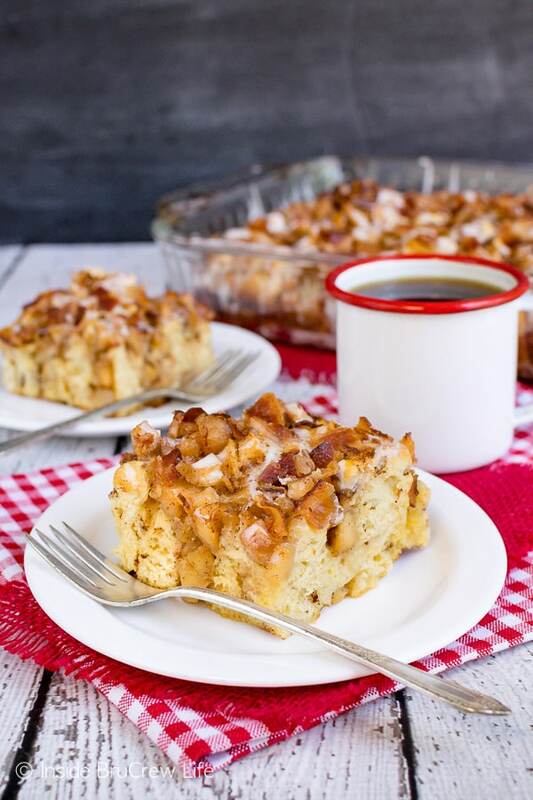 Apple Spice Monkey Bread from Pint Sized Baker – this gooey breakfast bake is loaded with apple chunks and walnuts. Perfect breakfast! Preheat the oven to 350 degrees. Spray a 9x13 dish with nonstick spray. 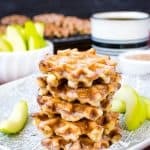 Place the diced apples, 4 Tablespoons maple syrup, and cinnamon in a skillet. Cook over low-medium heat until soft. Cut each individual cinnamon roll into quarters and place evenly in the bottom of the prepared pan. Whisk together the eggs, milk, butter, and 2 Tablespoons maple syrup. Pour over the the cinnamon rolls in the pan. Drop spoonfuls of the cooked apples on the top for the mixture. Use a knife to cut everything together. Bake for 28-30 minutes. Remove and cool for 5-10 minutes. Stir together the two containers of frosting that came with the cinnamon rolls and the 3 teaspoons of maple syrup. 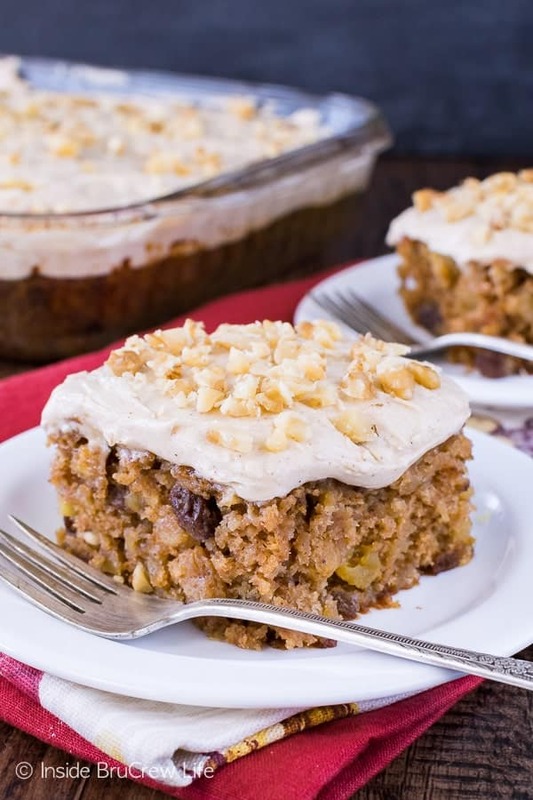 Drizzle over the warm cinnamon roll bake. Top with the crumbled bacon. Cut into 24 squares. 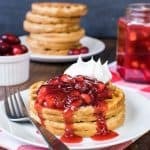 Love a savory sweet option! 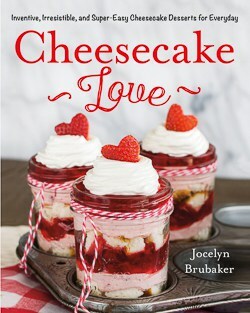 This looks amazing and your video was awesome. Peeling apples is one of those things that seems easy, but is actually really time consuming to me — love this option!